The Great Harry Houdini the Magician did his last show there in October, 1926. He busted his right ankle there, doing the Chinese Water Torture trick. Harry was punched in the guts a few days later by a semi-pro boxer. Went to the Detroit Grace Hospital with a busted appendix and he was operated on October 25, and died on Halloween on October 31, 1926. Wow there is History and maybe even Houdini's Ghost is in there?. Ginger, I belong to the Detroit Society for Genealogical Research: www. dsgr. org Please email me at KGMac63@gmail. com. I would be happy to try and find out more information regarding your possible connection with the Garrick Theatre. I am trying to find out if this is the theatre that my Great Grandfather owned. He was a magician and a pharmacist and apparently ran the drugs store and the theatre during that time. Does anybody know where I can get information on this. The Garrick was located where 1120-30 Griswold,is now located, where the Corned Beef place is now. The Post card people (Steve) have refereed to is a NxNW view of the corner of Michigan and Griswold. You can clearly see the Garrick located in the middle of the block Btw Michigan and State. 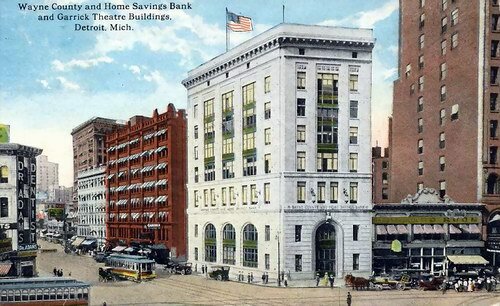 The David Stott (c1929) is on the corner of State and Griswold and the building next door to the south is where the Garrick was located. Someone gave me a Garick Theatre booklet that has the same cover as the one on the web site. I cant determine what year it is from, but it has lots of interesting advertisements including one from the Detroit Electric Car Co. I worked in the Kinsel Drug Store Building (Mich-Griswold) in the 1980's constructing a Taco Bell. I was told that the building at one time was the tallest structure (4) stories in Detroit. Nobody knew when the building was built. I believe it was built before the turn of the century. The post card view of the Garrick Theater shows a building on the far left that appears to be this building with an advertisement for a Dentist. I never knew the history of the Garrick and how close it was to this building. We explored the upper floors of the building through a stairway on Griswold. We found an optometry office that was left with newspapers on the desk from 1963-like someone just walked out-also the rumor was that there was a speakeasy in the basement-you could see an outline what looked like a bar and a stairway off the alley way-also you could see were there had been a fire at one time. It was an interesting building and I was sad to hear that it was razed in 2001. Just like everything in Detroit. If anyone has any information on the Kinsel Building please let me know-I believe it could have been allot older than what the information says. This caught my attention due to my 1970 involvement with the demise of Garrick Photo located on the eastside of Woodward near Temple. Owned / operated by its founding Mr. Garrick, who built it over decades to its widely-known peak, his partners then were his two sons; one of whom was Marvin who was quite active with Freemasonry. As to whether my above comment relates to this web-site, at a minimum it''s likely that the provenance of many historic photos hereon include ye olde Garrick Photo. The Garrick Theater was located immediately south of the David Stott Building and off of the northwest corner of the Majestic building. In the postcard of the bank and Garrick Building the edge of the Majestic can be seen at the right and the white building to the left of the Garrick is the future site of the David Stott building. 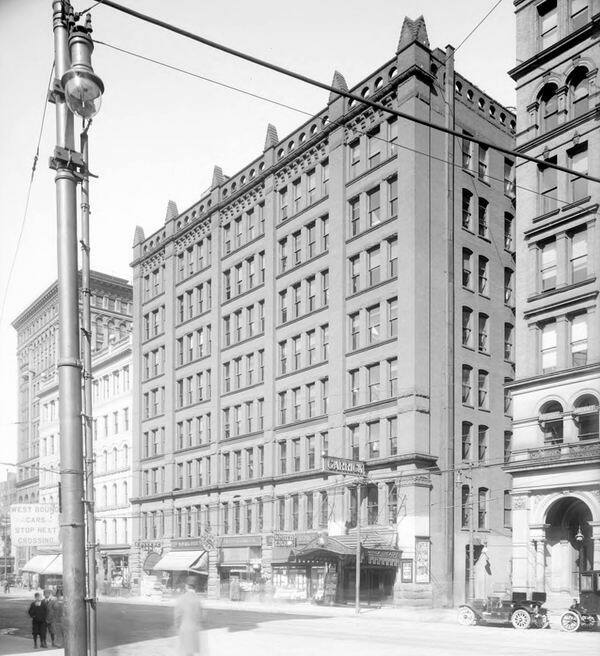 The Garrick was on the corner of Michigan and Griswold, adjacent to the Liberty Building. It was across the street from the Book Cadillac. 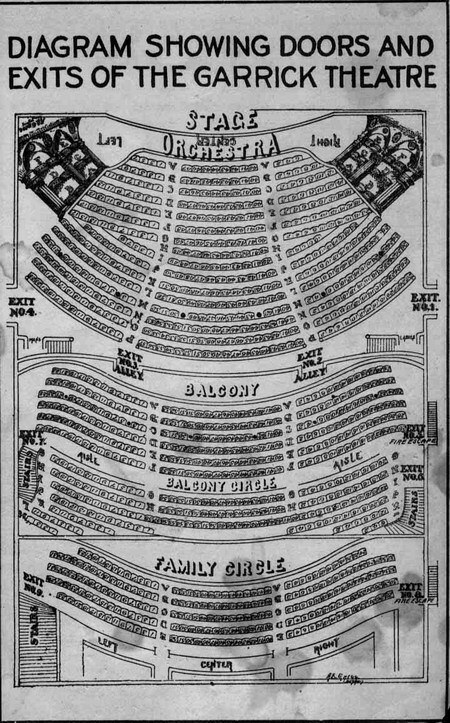 The Garrick was at one point the Detroit Opera House. After the opera company moved out, it was renamed the Garrick. 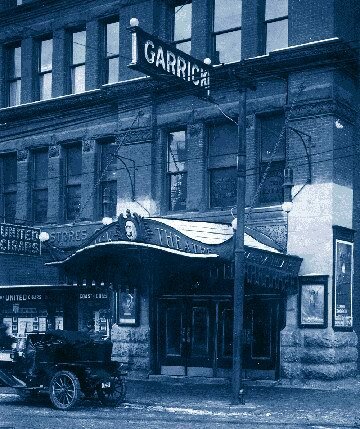 The Garrick was also Jessie Bonstelles first theatre, before she bought the Temple (now known as the Bonstelle Theatre and a part of Wayne State Universitys theatre program). After his last performance, Harry Houdini was taken to the Statler Hotel, where he had a suite. It was from there that he was taken to Grace Hospital, but only after he had the young house physician at the Statler call his doctor in New York for a second opinion. That delay may have proven fatal, although most likely, Houdini was in trouble before he entered the theatre that night. According to one web site, the land where the Garrick stood (along with the adjacent Whitney Office Building, which was neither the Whitney Restaurant nor the David Whitney Building) became the David Stott Building. The Metro Times says that that corner became Kinsels/Colton Building, home to Kinsels Drug Store. If the Metro Times is correct (and some others do seem to say so), then the site of the Garrick is now a hole in the ground, soon to become a parking lot. Houdini performed for the last time on Sunday, October 24th, 1926 at the Garrick Theatre in Detroit at the age of 52. He was suffering from acute appendicitis and a tempeture of 104. A local Doctor, Leo J. Dretzka examined him and made the diagnosis. Houdini was taken to his hotel which had a Dr.
on staff and was then taken to Grace Hospital in Detroit the next day. It was at Grace Hospital in Room 104 where he held on until 1:26 PM, October 31st, Halloween. His body was taken to N. Y.
for his funeral which took place on November 4th which drew over 2 thousand mourners. He was interred in the Machpelah Cemetery, Queens, N. Y. He technically died of peritontis from a ruptured appendix. He had taken a series of blows to the abdomen by a McGill University boxing student, J. Gordon Whitehead in Montreal two weeks earlier. (He was known to challange members of the audiance to strike him but he had not had a chance to tighten his muscles before the student landed several quick blows to his abdomen). The Garrick Theatre closed its doors less than 2 years later on August 11th, 1928 and was razed later that year. I made two major mistakes in trying to figure out where Harry Houdinis last performance was. First, I thought that Griswold went more east-west; in fact, it goes north-south. It starts as at Washington Avenue a couple of blocks south of Grand Circus Park and ends up at Jefferson Avenue near the river. Looking at that geography, it could be that the Garrick Theatre was closer to Grace Hospital than I originally thought. Also, I was wrong in thinking that Houdini was taken from the theatre to the hospital. In fact, he went back to his hotel, and was taken from the hotel room to the hospital. Therefore, the proximity of the theatre to the hotel is immaterial; it is the proximity of the hotel to the theatre that is important. Although I cannot be sure that the ad is genuine, I am now tempted to assume that the last show was at the Garrick rather than the Majestic. 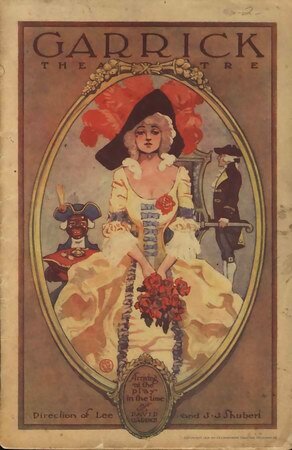 Many web sites state that the Garrick was the site of Harry Houdinis last performances. 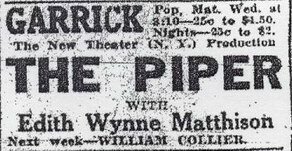 One site even has a scan of an ad which features the name Garrick and the right date (though no year) for the performance. (It is at http://www. geocities. com/houdinitribute/garrickad. jpg. ) However, the Garrick was on Griswold, which is near the river. Houdini died at Grace Hospital. The Majestic Theatre, also said to be the site of Houdinis last performance, would be on the path from the Garrick to Grace Hospital. I tend to think that the Majestic, being much closer to Grace Hospital, is likely where the last performance took place, but I cannot be sure. Both are good possibilities. The Detroit News, in its Rearview Mirror column, listed the Garrick as the site of Houdinis last performance. Any new information would be appreciated. This wasnt the last Houdini show. It was also, despite popular criticism, at The Majestic. It was actually at The Graystone Ballroom. This theatre was also the home of the Detroit Opera House in the early 1900s. This theater also did live shows. It was the place of Houdinis last performance before he died.